(Newser) – The Mars rover Curiosity is officially cruising. NASA completed its first test drive of the space vehicle today. 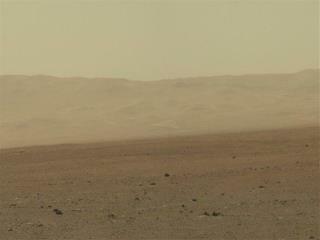 The rover traveled 15 feet, turned right, and then reversed a short distance, reports AP. "We're very excited to have this kind of milestone behind us," says one NASA scientist. "We see that the system is performing very well and we're in a great place to do some science." Why do people fail to understand the importance of exploration by mankind? Humans are always looking for answers to the unknown (Christopher Columbus/Galileo to name a few) and we will continue exploring space for as long as we live, so if you don't like it...well who cares what you think. New technology will be created, gays will marry, aliens will be contacted, marijuana will be legalized, and so many other things will happen that so many people disagree with, so forget about you, GO NASA. Who gives a crap about Mars anyway! We are never going to colonize it...heck it is all we can do to maintain planet Earth. Spend the money on "earth bond things" that will enhance the daily lives of humans. Mar's mission, just another (very) expensive toy for those who are not living in "the real world".